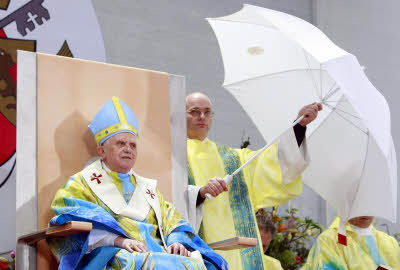 I must confess that, when I saw the pictures of Pope Benedict processing into Mass on EWTN, I assumed that the wet weather had made the colours run. Beneath his calm exterior he must have been cringing with embarrassment. 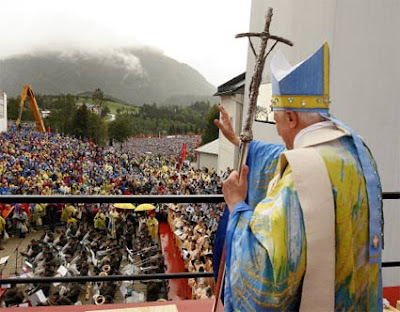 The vestments do raise the interesting question - unless Mariazell has special permission as a major shrine, does this mean that blue vestments for Masses of Our Lady are fully above-board? I am always happy to follow the Holy Father on such matters! Another question: I wonder what our beloved Pontiff will be wearing this coming Friday?! Besides the Sarum 'blue' and the Spanish indult for blue vestments on the Feast of the Imaculate Conception, are there other instances in particular locales where blue vestmenst are allowed? Its not the first time I've seen blue vestments, but they used to be more stylish in medieval times when they were quite a popular colour, with special significance to Our Lady. See my blog for such a specimen, which I have yet to write extensively about. I have more marvellous photos to share! Far from modernist, even if not quite above board! I wonder if that's the reason why that SSPX priest wore a blue chasuble on the Feast of the Immaculate Conception when I visited their Church in Manila last December. Does the indult apply to the Phillpines as well? It was a Spanish colony for about 400 years. The Canons Regular of St John Cantius in Chicago (www.cantius.org) celebrated the Nativity of the B.V.M with a Tridentine Latin High Mass. After Mass the traditional Blessing of Seeds was given from the Rituale Romanum 1962. The Canons also celebrated today the 100th anniversary of "Pascendi," the encyclical of Pius X condemning Modernism, the heresy of all heresies. They lead the faithful in renewing their devotion to Our Lady and to the Church by professing the "Oath against Modernism" of Pope St Pius X. The blue and yellow mix reminds me of those horrible skiing jackets on sale in the 1980s. The mitre manages to look cheap and tacky, it clashes with the rest and its colours are more reminiscent of the Swedish flag than anything liturgical. Who are the people who get to design such important things? These vestments will be seen around the world, surely they should get papal approval before they leave the drawing board? Maybe they do...this is even more worrying. Those vestments are wretched. The fact that the Holy Father can wear that horror and still retain the look of dignity on his face and holiness in his mien is reason number 1 million and 28 for why he's the Supreme Pontiff. Father: I enjoyed your series from UAE! Thank you for sharing. In addition to the "famous" Spanish indult allowing blue vestments, there is also a German (specifically Bavarian, I think) custom for the same. Perhaps it extends into Austria as well. The FSSP seminary at Wigratzbad owns a set of blue pontifical vestments shown here and in several other pictures on their website. But I'm not so sure that the Holy Father's vestments aren't supposed to be yellow, rather than blue: look at the dalmatic and the other priests' chasubles. There are plenty of other instances of the privilege of blue for Our Lady in the Church. Carmelites and the English Benedictines to name two. Could well be a local privilege at this shrine. Of course the Pope himself can freely grant himself every privilege he wishes. It gives pleasure to the Pope. Where did this idea of matching mitres come from? I understood that in the Roman Rite a mitre was either white or gold. "The FSSP seminary at Wigratzbad owns a set of blue pontifical vestments "
Serapion - I think you'll find they are actually white vestments with blue trimmings, which is perfectly acceptable in any Catholic community. One does not need an indult for those. Many Churches use such vestments for Marian feast. The mitre, on the other hand, is another matter altogether. It seems to be a protestant fashion which has recently started to make its appearance at Catholic services (I've seen pictures of orthodox US bishops like Bishop Carlson of Saginaw wearing them) . It's bad enough when the colours match - it's gruesome when they clash, as they did on those the Holy Father seemed forced to wear at Mariazell. The use of blue vestments on Saturdays and feasts of Our Lady is an Austrian and Southern German custom. (Perhaps in the Iberian peninsula as well. The FSSP in Salzburg do this regularly. Blue and silver do not clash. It is a great idea. In the Uk abbeys such as St Augustine's Ramgate also follow his custom. Sometimes white with a blue orphrey. I have only seen blue vestments once in my life and they weren't even worn - they were in the cupboard in the sacristy of the Shrine of Our Lady of Wilesden!